Three decades ago, having cancer had a huge stigma associated with it, but now, we celebrate cancer survivors. People are proud to wear ribbons and promote cancer awareness. However, the stigma surrounding mental health conditions is still strong. Our society holds the (false) attitude that a psychiatric diagnosis means there’s something really wrong with you—that you’re “crazy.” But it is critical for the well being of cancer patients that caring for mental health should be viewed as just as vital as prescribing the right cancer treatment. More than 40% of patients who receive a cancer diagnosis will have some significant anxiety, depression, and stress—it’s an entirely normal human reaction. You’re dealing with your own mortality and tackling some of the biggest metaphysical questions we face as human beings. These conditions can make the cancer treatment more difficult to manage, and if such mental health conditions are not addressed, increase the likelihood of patients giving up on treatment or giving up in general. 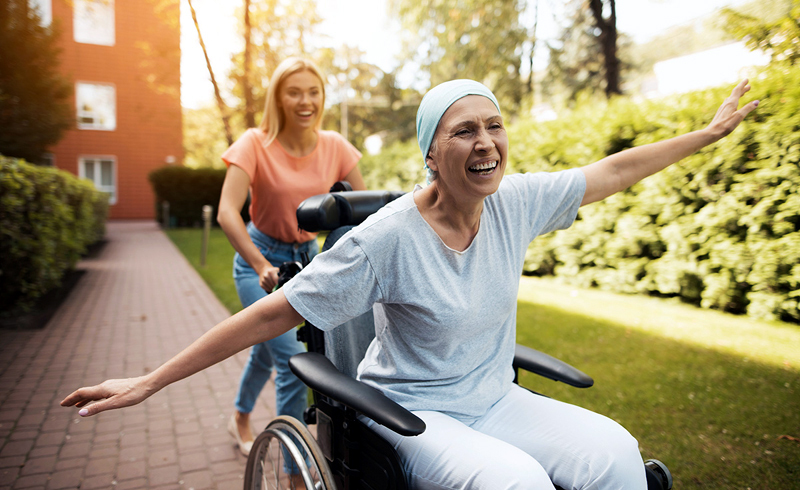 Fortunately, there are many strategies for treating the mental health of cancer patients, and once patients find a better balance, they often do better with therapy and have more resilience through its side effects. This adaptability then leads to better response to treatment and better survival. That’s why I prioritize the mental health of my patients and work closely with them to first embrace that these emotions and challenges exist, and then find a path to greater resiliency. I talk with each of my patients about how they feel about their situation and try to gain an understanding of what will benefit them the most. Depending on the patient’s concerns and comfort level, I might recommend they see a psychiatrist, psychologist, or mind-body therapist, join a support group, or practice stress reduction techniques on their own. There is a saying that life is 10% of what happens to you, and 90% is what you feel and do with that experience. I would amend what you feel and do with that experience is 100% related to the meaning of the experience you ascribe to it. Addressing mental health is another way of saying that who we are when we are alone – that personal, internal environment of our thoughts, emotions and beliefs - is an integral piece of paving a road back to wellness and it must be explored to have the best cancer treatment results. Some patients have a history of clinical depression or anxiety disorder and the severity of the symptoms reveal they could benefit from antidepressants and anti-anxiety medications. These work well for some patients, but sometimes forgotten is that mind-body therapies and stress-reduction techniques can improve mental health for those with less severe conditions without medication. If patients meet with a professional and it becomes clear their depression or anxiety is too severe to be resolved just by non-pharmaceutical approaches, they should be referred to a psychiatrist. One major way to improve the mental health of cancer patients is by practicing stress-reduction techniques. Stress creates secondary inflammation and production of cytokines that can impede the body’s ability to fight cancer. Our goal with stress reduction is not to entirely eliminate stress, but to make sure it does not progress to chronic overwhelming levels. One of the earliest evidence-based strategies utilized is relaxation and guided imagery. Basically, this technique consists of the intention to use your creativity and/or imagination to put yourself in a different emotional space. For example, patients about to undergo chemotherapy are often concerned about potential side effects. They might even believe that chemotherapy is just poison for their bodies, so giving them an extensive talk about the risk/benefit of each treatment is so critical before starting treatment. I might ask those patients, after such a discussion, to stop thinking of the medicine as poison, and instead, consider it a way of purging cancer out of their bodies. A common visualization request is that they imagine the cancer cells melting as the chemotherapy is infusing into their bodies. And when they do this, it’s a much more positive experience emotionally and in my experience, physically as well (in terms of side effects).